Get Psyched! is a 122-page self-help book that will immediately solve all of your problems... instantly! 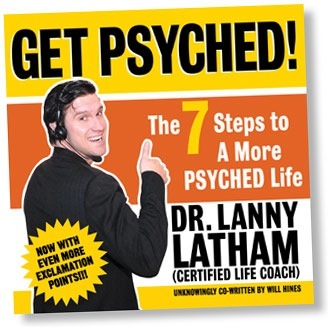 Written by Dr. Lanny Latham, a just barely former crystal meth addict and certified life coach. In fact, he's certified through a program that he created (and is sole graduate of). Get Psyched! "Changing the world, one exclamation point at a time." - Jon Glaser, creator of Delocated on Adult Swim. "Dr. Lanny Lathan is a stone cold pimp. Not in the sense that he doles out prostitutes and has no emotions. But in the sense that he is a STONE COLD PIMP!" "I do not think Dr. Latham knows it, but this book is hilarious."